30 members of TEAM BIGFOOT gathered at the ferry terminal on Friday 23rd of March at 5:00pm ready for the 5:30 Fullers crossing to Motutapu. We were all having dinner that night with event organisers from Total Sports, The Motutapu Trust, DOC, stakeholders, marshals and a few participants. The crossing to Motutapu was as usual fantastic. With views of the city diminishing and the inner islands flying past, you got the feeling that you were going to a very special place. The tightness of the city was relinquishing its grip to easy laid back island time. 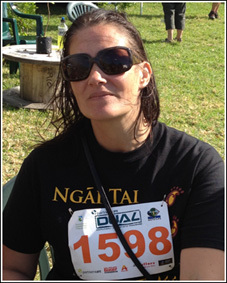 Motutapu is a very special taonga. Taikehu settled near Rangitoto on the motu he named Motutapu, following which the island became known as "Te Motutapu a Taikehu". 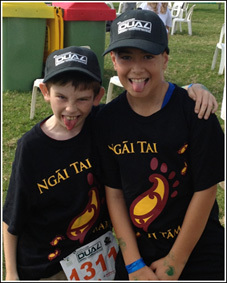 Motutapu is currently part of Ngai Tai treaty negotiations. This event helped to strengthen those inherent ties within the Team and served to make us all feel like we belonged to this island. 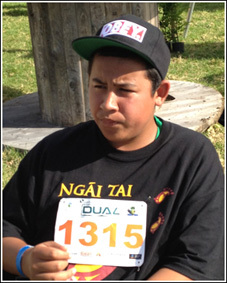 There is no better feeling when you are on your whenua, then that of belonging. As we disembarked at Home Bay a fleet of 4 wheel drives, a tractor and a couple of trucks whisked us up to MOEC which is situated on the other side of the island at Administration Bay. I was lucky enough to see one of the newly released Takahe up close. It was a stunningly beautiful bird. The facilities at MOEC are very well kept and it is an excellent place to host large numbers of people with ease. 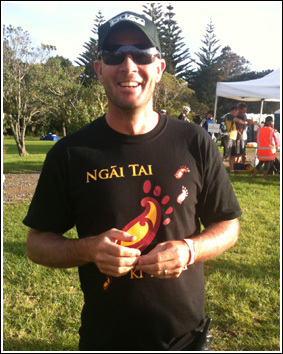 Dinner was great with James giving an excellent speech on behalf of Ngai Tai and strategically handing out some of the hugely popular Ngai Tai "TEAM BIGFOOT 2012" t-shirts. There were also several t-shirts given away as prizes. The night was spent exchanging stories and catching up with old friends and family. 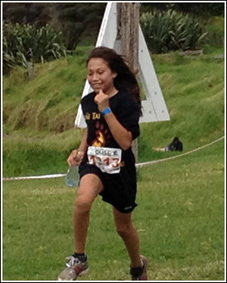 When we arrived, Home Bay was teaming with competitors for the start of the 50km mountain bike race . 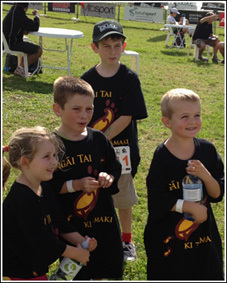 James performed karakia, mihimihi then we all joined in on the waiata. James was then invited to start the 50km bike race.... and competition day was officially opened !!! The races were staggered. The 50km mountain bike race was followed by the 30km mountain bike race with the marathon and half marathon starting before the 10km run/walk which started around 11:15am. 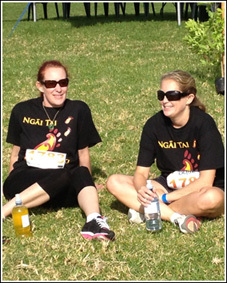 Most of TEAM BIGFOOT were competing in the 10km run/walk. As usual we had a good mix of competitors from 7 to 62 years old. The terrain was very unforgiving. There was always the possibility of rolling your ankle so you had to be extremely careful and have your wits about you. Also because of the terrain the run felt alot further then 10km. It really did test all the participants in all the events. On the other hand the views were magnificent and the clean ocean air was totally invigorating. 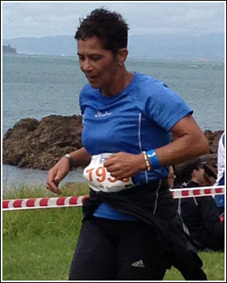 The motu provided the perfect backdrop for an excellent race-course. Our best results for the day included Zane Lee 5th and Ronin Moosman 7th in the junior 10km run and John Clarken who was 2nd in the open division. These were awesome results. That we had 20 people competing was the real benefit of this trip. As we all headed towards to wharf I couldn't help but feel like I could have stayed much longer. As we boarded the ferry Don McGlashan was arriving with his band for the post-event concert. We sailed back to Auckland exhausted. It was only 24hrs earlier that we were sailing the other way towards Motutapu. Action packed 1 day....oh yes.....but thats how TEAM BIGFOOT ROLL !!! This event was a huge success for us and a huge success for the event organisers. 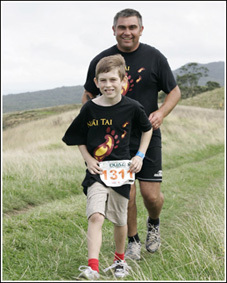 A very big thank you to Aaron Carter and Total Sport for their generosity and also to the likes of the Motutapu Restoration Trust, DOC and MOEC for helping with logistics and transport. There were many more who contributed to make this event a real joy to take part in. 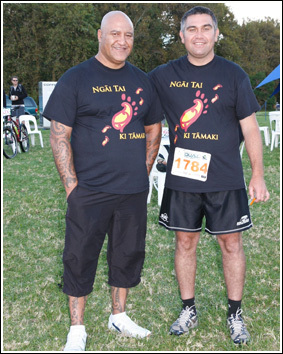 Internally I would like to thank the Ngai Tai ki Tamaki Trust for sponsoring our t-shirts and the event and TEAM BIGFOOTS' kaupapa. 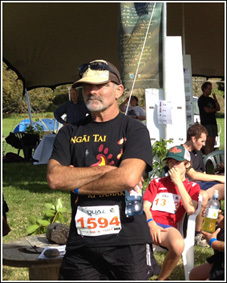 I am really looking forward to this becoming an annual event for Ngai Tai and I would like to personally congratulate all TEAM BIGFOOT participants and of course our support crew for making this event so awesome. 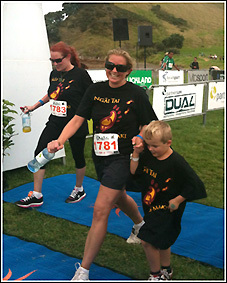 Well done whanau.....SEE YOU ALL AT THE NEXT EVENT !! !